ThirtyFifty hosts regular wine tasting experience days and evening in Liverpool for you to learn about wine and have some fun too! Both our Wine Tasting Evenings and Saturday Experience Days make the perfect Christmas and birthday gifts for budding wine enthusiasts. Our evening wine tasting experiences include 7 wines to taste along with cheese and charcuterie platters to share, while our one day wine course has 17 wines and a three course lunch with matching wines. These events are hosted at the very central Piccolino restaurant, located between Moorfields and James Street stations. You can purchase an open dated gift voucher so that the date can be booked with us after your gift has been received. We'll email you a link to the gift voucher to print off. If you prefer, we have pre-printed gift vouchers that we can post to you or your gift recipient for �1 (select on check out). If you wish a specific date simply click the date for the event below. 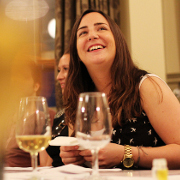 Our evening Liverpool wine tasting experiences make a perfect gift and are both refreshing and fun, but also easy for enthusiastic amateurs to get a real solid grounding that will help them navigate the world of wine with confidence. In addition to tasting some delicious wines there are charcuterie and cheese platters to tuck in to for a light supper. For more information on our different tastings click on Evening Wine Tasting Experiences.